Back when my own experience of wine was limited to cheap ‘plonk’, I had dinner with a friend who was exceptionally knowledgeable about wine. He – naturally – chose the wine. Until this time, I thought the florid descriptions of wine tasting sessions were the result of pretentious nonsense and hacks being paid by the word, but this bottle of wine changed all that for me. I discovered a complexity of nose, palette, and ‘mouth feel’ that made me view that flowery prose of wine writers with greater respect. It was, quite simply, the best glass of wine I’d ever tasted. To my fellow diner, however, it was an OK wine, but nothing special. The point of this little tale is that how you view the SRS-3100 system is somewhat governed by your viewpoint. And this speaks to a potential problem for reviewers, professional and especially amateur: if you view the SRS-3100 in the light of My First Electrostatic, then for many the reaction will be “Oh my God! Where have you been all my life!” But, if you look at this from the point of someone who has tried several seriously up-scale electrostatic designs, you’ll think it a fine and inexpensive unit with some understandable limitations in absolute clarity and the bass due to the structural design of the earspeaker itself. In fact, both aspects of the SRS-3100 performance are true, but I’m coming down on the side of the newbie, here. The fascinating thing about the SRS-3100 from that newbie’s position is just how good it is. I mean, really, ear-openingly, oh-now-I-get-it good. 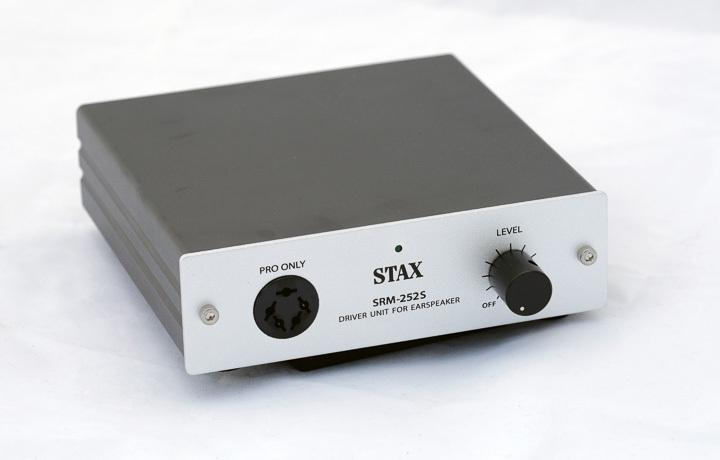 If you are used to dynamic headphones – even really good ones that cost a lot more than the SRS-3100 system – the first time you hear this Stax sound, it’s a revelation. Yes, there will be people who hear that revelatory midrange and treble and conclude that they still need that powerful grip and weighty physicality of the sounds from a dyamic, but equally there are more who will be reaching for their credit card within minutes. For many, the SRS-3100 will be their first time with electrostatic headphones, or ‘earspeakers’ in Staxlish, and for some it will be the gateway to a world of electrostatics, and for others it will be the beginning and end point for that electrostatic musical exploration. OK, so recent advances at the top end of dynamic and planar magnetic headphone design have levelled the playing field, so that the best of dynamic designs (like the HD800S from Sennheiser, or the Focal Utopia) and the best of planar dynamic designs (such as the HiFiMAN Susvara, the Audeze LCD-4 or the MrSpeakers Ether Flow) now provide much of what the electrostatic user craves, but none are as affordable as the Stax SRS-3100. What the SRS-3100 does is define the electrostatic earspeaker experience for the user, and while the only way from here is ‘up’ that initial exposure is something you will never forget. In essence what that initial experience does is make is make it seem like you have music in the space around you, only slightly attenuated by the device you wear over your ears. Perhaps the most telling part of the SRS-3100 performance is what happens when you take them off and try a dynamic headphone you are very used to. For most new-to-electrostatics listeners, suddenly what used to be acceptable now sounds arch and uneven. A sound you thought expressive and natural will sound blurred and false. Vocals you thought understandable now sound like they are being sung through cloth. That’s a no going back moment, and even if you don’t buy the SRS-3100 there and then, its conversion process has begun, like a sonic reprogramming. The thrill of hearing a pair of electrostatic ‘earspeakers’ for the first time really should not be attenuated, and if the SRS-3100 is your first time you drink from the cup of Stax, get ready for a heady brew. I’m not even going to call out musical examples here because it may make you reach for the same and that might spoil the experience. Choose your own weapons here; play music, and enjoy what could be the start of a serious Stax addiction. The more critical faculties kick in when you have a few more miles on the odometer, and know what good electrostatics (Stax and others) are capable of. The SRS-3100 tries hard – and let’s be honest, at the price, that trying hard is more than admirable... it’s astounding – but the limitations made to bring this system down to a manageable price take an audible toll. The SR-L300 is only some 17g lighter than the next Lambda model in the range, but it feels both lighter and less substantial than its stablemate. And that relates to control over bass and depth of bass. Hopefully no one expects SR-009 bass slam and drive at this price level, but what you get on playing ‘Surfin’’ by Ernest Ranglin [Below The Bassline, Island] and Ira Coleman’s solid, yet almost louche bass underpinning has more of an accent on the ‘louche’ than the ‘solid’. It also lacks some of the absolute depth needed to give this beautifully recorded slice of reggae-meets-jazz a foundation of bass and drums. Dynamic drivers will show up this difference all too readily, but here even the lithe and live beauty of Monty Alexander’s piano playing may not win everyone over.